Turns out the SunFounder RT5370 (on the top, with the stylin’ curved case) has better performance than the Wifi With Antenna (on the bottom, with full-frontal chunk goin’ on), by a not inconsiderable 5 to 10 dB. Boosting the received power level in the fringe areas of our house from -70 dBm to -63 dBm makes all the difference between not working and steady streaming. The built-in WiFi antenna on a Raspberry Pi 3 ticks along 10 dB lower, with -80 dBm (10 pW!) at the receiver making for poor communication: a Pi 3 works perfectly within reasonable line-of-sight of the router (even through our wood floor) and wakes up blind in fringe areas. Hacking an external antenna probably helps, but definitely isn’t a net win compared to ten bucks worth of USB adapter. The wavemon utility (it’s in the Raspbian repo) comes in handy for figuring that sort of thing. I ordered another SunFounder adapter, Just In Case it comes in handy, with the hope that both behave the same way. This entry was posted on 2017-01-11, 07:08 and is filed under Electronics Workbench, PC Tweakage. You can follow any responses to this entry through RSS 2.0. Both comments and pings are currently closed. Most buyers are more interested in the chipset (which determines driver compatibility) than RF performance. 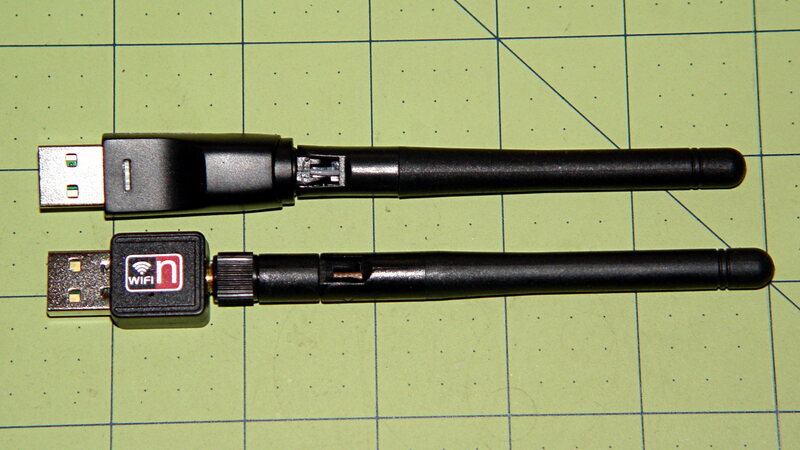 It does look like the bottom one might have a removeable antenna you could replace with a higher gain one. Currently my WiFi access point lives in the basement, which gives decent coverage on the ground floor, but less so upstairs. I want to move it to a shelf at the top of the attic stairs, which would put it near the center of the house in all three dimensions, but there’s a daunting amount of stuff in the way in that wall. A random-length wire dangling out of that SMA jack should do it! I put that one in a room with enough signal strength, after I moved the router to the middle of the basement. Before that, there was zero signal in the far end of the house; every little bit helps. This advice was actually dispensed at a Best Buy by a “geek,” and I’ve seen it repeated all over the Internet. Must be true: it’s on the Internet. While antenna height is useful for longer distance links (one reason the ISS can make contacts with modest equipment is that they completely win for antenna height), and it may even be true in some cases for WiFi (putting it below an angled metal roof might give a little gain), the explanation given has nothing to do with physics as we know it, but it still made me smile. Somewhat related; I’m looking for an ethernet-only WiFi adapter. IOgear sells a couple, but at least in manual setup mode, they leave the shared password visible in plain text. Arggh. (Whether this would be visible to somebody not on the network isn’t clear, but still.) I need to go 40 feet from a cabinet in the back yard to the wireless router. I really don’t want to do a Raspberry Pi/USB wireless hack. My gotta-do stack is big enough. Anybody familiar with this widget, or something else? This is all I found on Amazon. The wpa_supplicant file should be read-write only for root, if that’s any consolation. The problem seems to be in the browser based setup it uses. Manual setup leaves everything on a fixed IP address, but no word about what shows if you use WPS. I might be able to block the widget’s IP address from the wireless network (using a laptop to program the thing.) It’s cheap enough to try at $35 for the basic one.